With so many car meets sprouting weekly across America, some feel that a few need to be shut down. Heck, even some that attend a meet regularly just feel the urge to get it shut down. Might be boredom or just plain lack of common sense, but somehow there is the need to ruin it for everyone else. Given this popular interest in ruining car meets that seems to be prevalent, I’ve decided to draw up a series of steps that will help aid those who wish to succeed at ruining their local car meet. The steps below will teach you exactly how to ruin a car meet. Follow carefully and repeat weekly and you’re guaranteed not to fail. Nothing is better to show your intentions of ruining your local car meet than showing up like a total douche. This is actually very easy. First, make sure to arrive speeding and driving recklessly. Blaring music out with your windows down helps add to the effect. It doesn’t matter if it’s gansta rap, metal or dubstep, just make sure it’s very loud. Then, drive through the meet itself faster than you should — Just to make everyone uncomfortable. Finally, you have a choice here, either double park to let everyone else know what an awesome ride you have and that no one else should park next to you, OR park super close to the car next to you in order to scare the owner thinking he’s gonna get door dings. If you drive a Honda, make sure to park next to the most expensive Ferrari you can find. That helps too, more if you park super close to it. Oh, and make sure your car sticks a little further forward in your parking spot than the guy next to you. That’s always important. Who cares that there’s kids around. Cursing and blowing smoke from your cool-as-heck e-cigs is one great way to become really popular as the badass at the meet. The rest of the time, just be loud. Here’s a good one to pull off. During the meet, hop in your car and fire it up. Rev it to redline a couple of times so that people can hear your sick straight pipe. This is specially effective at morning meets, like Cars & Coffee. Since mornings are usually kinda quiet, your straight pipe’s gonna sound even louder and therefore cooler. 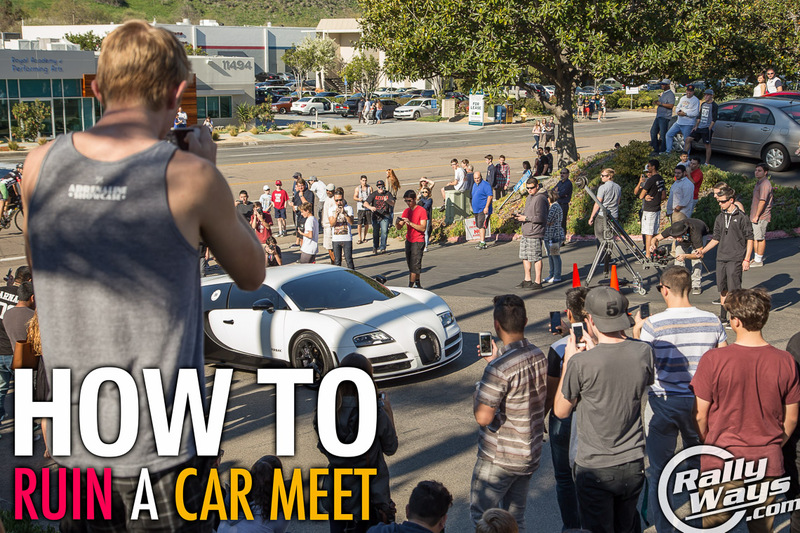 Here’s the most important step to effectively ruin a car meet. This final step has ruined more car meets than any other, so read carefully. Your exit strategy has to be stellar. Like, everyone needs to know. The trick is to rev your car to 4K and then launch. Yeah, right at the exit. Make sure to redline it between first and second. If you can chirp your tires, even better. That sweet straight pipe you bragged about earlier will come in handy for this step. If you have a more powerful car, say a Mustang, you’re in luck! See, with a car like that you can actually do a burn out before you take off. Then, you can finish it off with a sick drift on your way out making sure you get that back end out a bit into the other lane, just for added effect. If you lose it and spin out, it doesn’t matter. After all, you’re trying to be a jackass so who cares, right? If you crash, that’s fine too. That’ll seal the deal but at a greater cost. If you follow the steps above carefully, you can achieve boss status and help shut down another car meet. If you don’t manage to do it on the first attempt, just wash, rinse and repeat. Show up the following Saturday with a different shirt and a hat, so nobody knows it’s you. Then, just repeat the 4 easy steps outlined above and there will be zero chance of failure. If you still somehow fail, then crash your car on exit. That’ll be the end of it. If you want to comment on the topic, take the conversation to Twitter. You can discuss there using the #RallyWays tag and replying to us @RallyWays.